Why do you choose iMissiu? Material & Design: Latest Hammock Material Revorution. We use the durable nylon with web design which made the hammock cooling instantly and more breathable in the Summer Rope. Guarantee: Way Too Easy Money Back Promise Our promise is that our product is just as great, better or the best out there and we back it with our crazy promise. If you are are unsatisfied with our hammock, you could contact us and tell us your reason, then we will give you your money refund within 5 hours and you can keep the hammock. 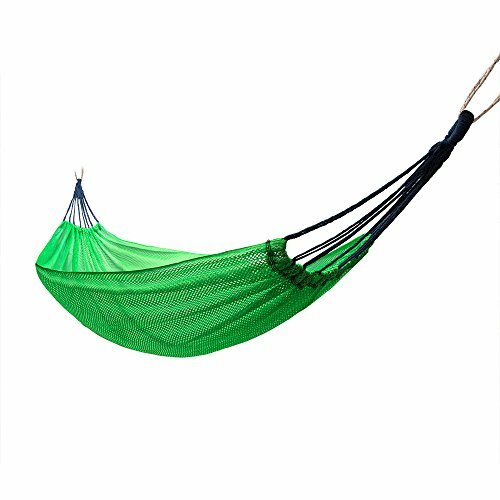 ✔ LIGHTWEIGHT & COMPACT - SIZE: 75"(L) x 52"(W) ,Made From Nylon, These Web Cooler Hammocks Are a Outdoor Lover's Dreams In The Hot Summer .It Is More Breathable & Cooler Than Other Traditional Hammock. Lightweight, Quick Drying and Portable for Your Outdoor Travels This Summer. This Hammock is A Fantastic Companion for Any Trip Where Saving Space and Keeping Weight Down is Important. ✔ EASY SETUP: You Will Have Everything You Need for Quick and Easy Hanging Setup. It Will Take Less Than 2 Minutes to Hang Your Camping Hammock On a Tree or Nearby Objects Using The Ropes, Strips and Carabiners. ✔ QUALITY OK - Hammock legitimately holds up to 480 lbs. Made from 80% Cotton and 20% Nylon so it is soft and durable. ✔ SLEEP SOUNDLY - This beautiful hammock is a fun way to relax on your porch, in your backyard, or even when you're camping. They are handwoven from a cotton material making the hammock bed soft as well as extremely comfortable. Sized for one adult person. ✔100% SATISFACTION GUARANTEE - If you don't like your hammock, or whatever, we'll instantly refund your money . If you have any questions about this product by iMissiu, contact us by completing and submitting the form below. If you are looking for a specif part number, please include it with your message.